Though it can seem deceptively simple at first, more goes into making a minimal bedroom feel complete than you may think. While a tidy clutter-free and modern spirit come to mind when thinking about a minimalist bedroom, the design style doesn’t stop there. Sure, clear surfaces and simplicity are surefire symbols when considering minimalist bedroom decor, but you’ll find much more freedom than that available. Minimalism can provide you with a relaxing, timeless bedroom as clutter can be surprisingly stressful, often subconsciously. 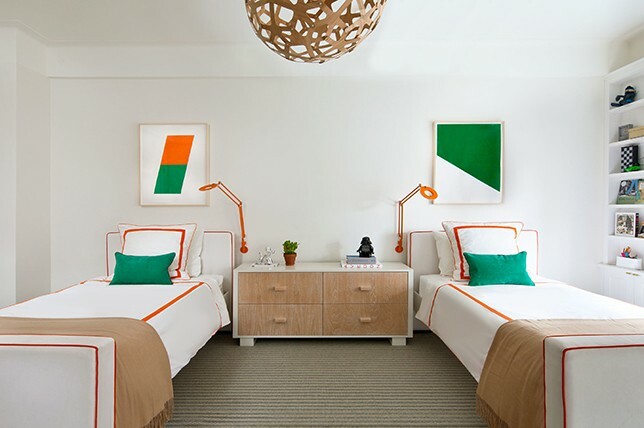 If you are looking to de-clutter your space and create a bedroom that would be any minimalists haven, consider these minimalist bedroom design ideas culled from Décor Aid interior designers as a guide to get you started. When it comes to a minimalist bedroom, no matter how large or how small, one of the major design keys is to conceal as much as you can to keep the area feeling sleek and simple. And while many like a t.v. in their bedrooms, it’ll be sure to distract from minimal minded decor. And though it can be an expensive investment, smart built-in storage cabinets will also add value to your property when looking to resell. For inspiration, look at how effortlessly cool the hidden bookshelf in the bedroom featured above looks. Sure, everything on those shelves initially looks attractive to the eye, however, the bedroom would have a totally different feel if its contents were always exposed. Create a dynamic mood by going for one color to decorate the room. This way, you’ll have an easier time bringing everything together, and your minimal bedroom will look brighter and larger. The key here is to add texture and different shades of the tone for needed depth. And just because we’re talking minimal bedroom decor doesn’t mean that you can only work with white, black, and gray. In fact, any shade will do as long as you keep the entire effect on the subtle side. Even if its a vibrant shade of red. When in doubt, choose low-slung furniture to make your minimal bedroom feel more like a zen oasis as they’re also great for practicing feng shui. Low-slung furniture will also help to create the effect of higher ceilings and more depth to even the smallest of bedrooms. To get the look right, keep in mind that accessorizing with purpose is essential, so make sure you bring in pieces that you truly love and ones that are multi-functional to justify their existence. When it comes to decorative extras in a minimal bedroom, simple and refined black wire features will add a subtle yet stylized note to give the space an edge without visually cluttering it. When you do bring in an accent color, stick to three pieces to keep the look consistent, like a blush velvet bench with blush velvet pillows to add dramatic flair and personality without overdoing it. When it comes to a minimal bedroom, keep your bedding simple yet sumptuous. A standard dove white duvet cover and a casual wool throw will help you achieve a minimalist look with ease. It should go without saying that minimalism doesn’t mean that you can’t fill your bedroom with luxury finds, so why not treat yourself to a stunning four-poster canopy bed? A minimalist design will mean you end up with less on the walls and less on your surfaces, so a simple four-poster bed is a great way of adding some visual interest and a dramatic focal point to a minimalist bedroom. 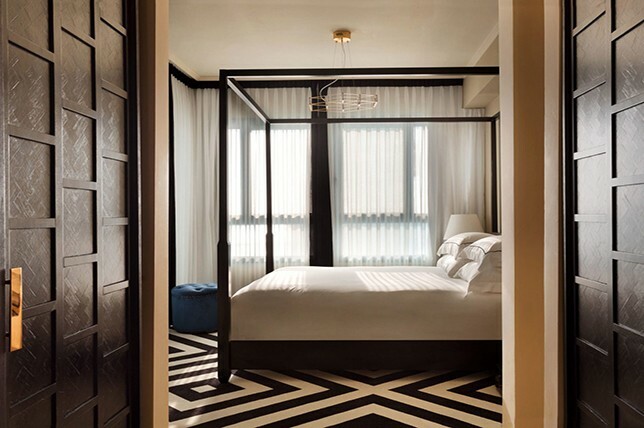 To get the look right, consider chic four-poster bed options in matte charcoal, white and wood tones, as well as black, and high-shine metallics for added glamor. Nightstands can take up a lot of needed floor space in a small bedroom, and floating nightstands make for a modern space-saving alternative, as well as helping you create the ultimate minimalist bedroom that’ll feel timeless for years to come. You can also opt for a pair of matching floating shelves and have them installed at a lower height next to your bed, so you can use them as nightstands. This is a makes for an affordable and easy to install minimal bedroom idea which will also open up the space, and they’re much more inexpensive than a standard nightstand, making them a great alternative for when you’re looking for minimalist bedroom ideas on a budget. An all-white bedroom is about as minimalist as you can get and timeless to boot. White as a main color scheme will help to create the feeling of spaciousness in your minimalist bedroom, making it an essential option when considering the best minimalist bedroom ideas for small rooms. White flooring, white walls, white furniture, and white soft furnishings will come together with ease to create the purest of private sanctuaries. You’ll find yourself at the height of relaxation in an all-white bedroom as there is nothing to distract you. If you already have a room full of furniture which you aren’t ready to let go of, try your hand at upcycling and paint your furniture in a matching shade of tonal white – great for when you need minimalist bedroom ideas on a budget. Again, if you aren’t a lover of stark white, different shades of gray may be the answer to your minimalist bedroom design idea dilemmas. Comforting grays will keep your bedroom feeling simple in appeal, but you can also go for warmer tones and use different shades to add needed style and definition. Lighter grays will also work to help keep your room feeling spacious and darker grays help to keep the space feeling more intimate. And for a layered feel, mix and match gray shades around your bedroom and add texture for depth and a comforting feel. A pale blue is a great gender-neutral color to use to use to your advantage to add some needed depth to minimalist bedroom design ideas – it is soothing and refreshing and won’t distract the eye from the minimalist space you have created. However, out interior designers suggest not going overboard with a powdery blue – simply use it as an accent color. Maybe as a simple geometric pattern on some bed linens? Or a soft shade for some velvet upholstery? Let it crop up here and there in small doses, but never allow it to steal the show and take away from your minimalist bedroom decor. Natural light can make or break a minimalist bedroom. If you are working without natural daylight, even the most simple of minimalist bedroom designs can feel dark and gloomy. And who wants to start their day in a dark bedroom – so let in as much natural light as you can, or fake it. This might mean investing in a new window treatment, such as slatted blinds, or sheer curtains which are lighter and allow for more natural light to filter through. The lighter or more neutral the color of your blinds or curtains, the more light will filter through – so choose treatments that are both light in weight and in color. A misconception often made about minimalist style is that all the walls need to be painted optic white. White is a great color for achieving a minimalist look, for sure, but it isn’t the only option when it comes to creating a unique minimalist bedroom. If you find white to be cold and uninspiring, there are plenty of other options – wood chalet-inspired paneling lifted from Mid-Century Modern design being one of them. One of the key aspects of minimalist design is simplicity, and what could be simpler and more organic in feel than a wood-paneled accent wall? It will keep your room feeling warm and inviting while affording you the simplicity that you want from your minimalist bedroom decor. Take a step away from the kind of cold minimalism we all know well and consider a warmer Scandinavian take instead. Nordic minimalism tends to be on the more charming side and involves more color than sterile minimalist bedroom design ideas often do. Pinks and blues sit alongside warmer grey tones and the usual, classic whites. Demure patterns also feature more in Nordic minimalism, giving your bedroom a cozier feel with a dose of personality that can be comforting, especially if you are new to the many restrictions of minimalism and want something that isn’t too aggressively spartan. 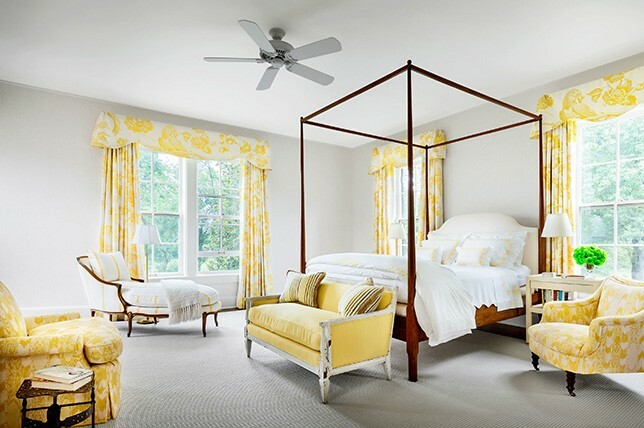 It’s always tempting to go for bed linens with a fun pattern on them or something that looks traditional and luxurious, but a good quality set of white bed sheets will be all that you need when creating a perfectly appointed minimalist bedroom. White bed linens are easy on the eye and soothing at that as they won’t draw and distract the eye like a loud pattern can do, helping to keep your bedroom to feeling calm, relaxing, and un-fussy. A good set of white bed linens can be an investment but when it comes to timeless minimalist bedroom tips, they’re a sound addition not to be overlooked. 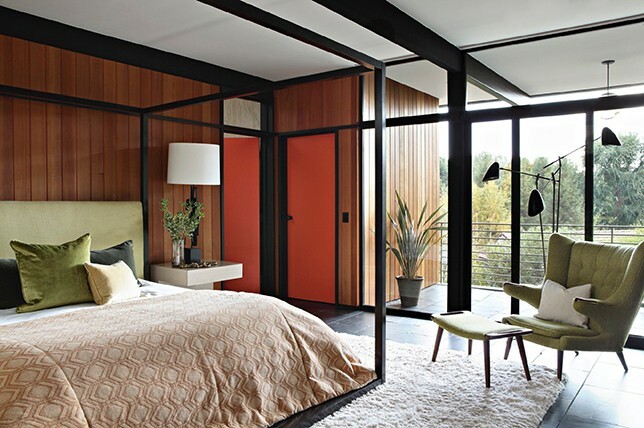 Furniture with slim legs and a lean silhouette is the epitome of truly minimalist bedroom style. Slim legs allow you to see more floor and wall space, adding to the spacious feel of your minimalist decor while opening up the room. Sleek furniture like this can make for a major impact on how large your room feels – the perfect minimalist bedroom ideas for small bedrooms. Think about selecting furnishings in lighter wood tones and neutral colors that will help to expose as much floor and wall space as possible, especially when looking for a new desk and bedside tables, as they are necessities that can often be found in smaller scales to fit any bedroom design style – even the eclectic and maximal for your next total bedroom upgrade. 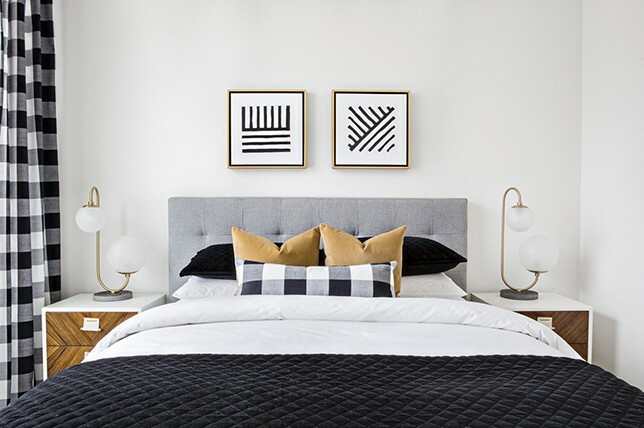 If you are looking to bring in some intriguing art into your minimal bedroom, there’s plenty of subtly chic additions that can be found relatively inexpensively to add needed warmth to complete your minimalist bedroom. Art doesn’t always have to boast a riot of color, brightening up your wall and making a bold, colorful statement. Art can be understated and muted in color while still offering the impact you desire. By bringing in wall art that is predominantly white, whether that’s a sketch, a line drawing, vintage photograph, a painting, or even a sculpture, you’ll instantly add needed personality to your minimal bedroom ideas. 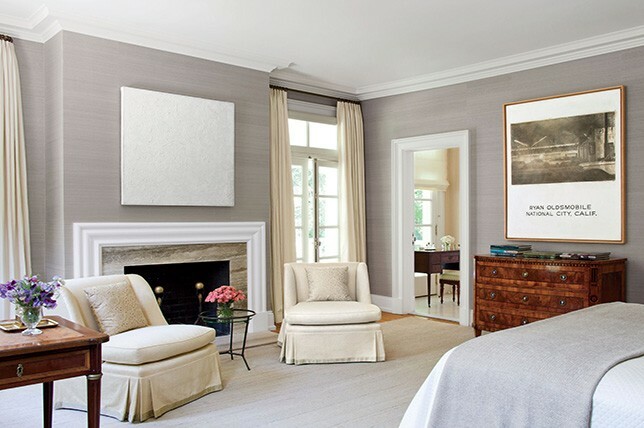 In fact, you’d be surprised at the amount of minimal art available that is focused on primarily using white, while making your bedroom appear larger and brighter. And the larger the scale the better as when it comes to minimalist bedroom decor, there should only be one statement-making making piece to focus on. Ladder storage makes for a great idea for a smaller minimalist bedroom as they take little floor space while providing ample storage shelving. They also stop pesky clutter from taking over your bedroom while giving you a handy place to store tomorrow’s clothing (when they boast valet features), blankets, and accessories like scarves, belts, and jewelry. However, since ladder shelving only offers you a small amount of additional storage space to work with, you won’t be at risk of cluttering it with items and the simple, straightforward design of a bookshelf ladder is naturally minimalistic on its own. They only allow you to store a certain number of things you need on every given surface, making for a great way of keeping your bedroom under control, which in essence, makes ladder storage solutions one of the top minimalist bedroom tips to consider.